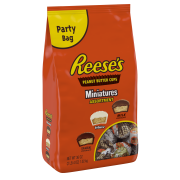 Product - Reese's Peanut Butter Miniatures Assortment Chocolate Candy, 36 Oz. Product - Reese's Peanut Butter Miniatures Candy, 19.75 Oz. Reese's Peanut Butter Miniatures Candy, 19.75 Oz. Fill your candy dish with REESE'S Peanut Butter Cups Miniatures. These individually wrapped treats are also great for lunches and snacking. Product - Reese's White Peanut Butter Miniatures Candy, 12 Oz. Reese's White Peanut Butter Miniatures Candy, 12 Oz. Just when you didnât think REESE'S Candy could be any sweeter, REESE'S brand wrapped its classic peanut butter in creamy white candy! Delight in this deliciously different miniature peanut butter cup as an on-the-go treat, in white chocolate macadamia nut cookies, or straight from the nearest candy dish. Product - Hershey's Reese's Miniatures Fall Harvest Peanut Butter Cups, 28 Oz. Hershey's Reese's Miniatures Fall Harvest Peanut Butter Cups, 28 Oz. If you love the taste of peanut butter and chocolate, you'll enjoy these Reese's Peanut Butter Cups. They are an ideal addition to any candy dish. You can add these Reese's butter cups in recipes for incredible flavor. These miniatures are an ideal size when you just need a quick bite to satisfy your sweet tooth. Product - Reese's Holiday Peanut Butter Cups, 1 Lb. Reese's Holiday Peanut Butter Cups, 1 Lb. These REESE'S Holiday Peanut Butter Cups make an excellent addition to any collection of sweets. Give them away at your next party or get-together. They serve as wonderful gift bag candies. Made with a unique blend of HERSHEY'S Milk Chocolate and REESE'S Peanut Butter, these REESE'S peanut butter cups are ideal for anyone who enjoys this classic flavor pairing. This 1 lb pack includes individual servings of candy, allowing you to enjoy them one by one. Each pack includes two REESE'S milk chocolate Peanut Butter Cups. The bow image on the front of the packaging makes these treats especially well-suited for the holiday season.